This microscope was here when we bought the practice. There’s nothing fancy about it—it’s just a solid piece of equipment that I use every day. Its biggest advantage is that I can give clients an immediate answer to certain problems. If an animal has a skin lesion, I’ll use the microscope to discover if it’s something benign or something nasty. I can then recommend the appropriate medication, whether it’s antibiotics or anti-inflammatories. I can also advise the client if it needs to be removed surgically or if further investigation is required with a sample sent to the lab. I also use it to check a dog’s ears to see if that dog has a yeast or bacterial infection. Once again, there’s no need to send anything to the lab—the information is all at my fingertips. 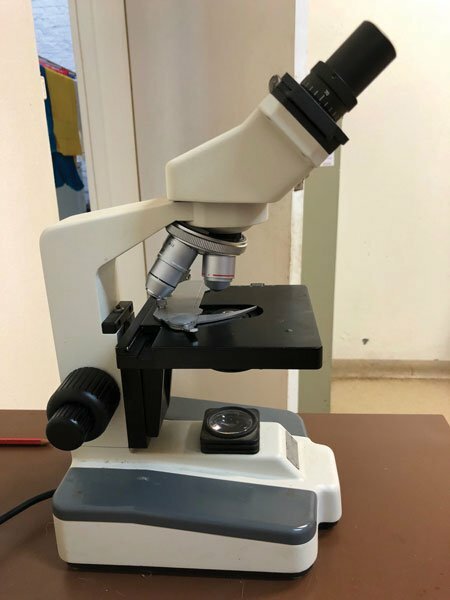 A microscope is an extremely handy piece of equipment for investigating ears, skin, lumps, abscesses or any kind of fluid within the body. This microscope is bifocal and I’ll often let the client have a look at the results. Most of them love to see exactly what’s going on. At the moment we’re renovating our clinic and a microscope with a screen is on my wish list. I would like one with a broader field of view as this one is quite narrow. Displaying the image on a screen would make it much easier to show and discuss the results with clients. It also makes it easier to consult with colleagues and send off an image to a specialist. I would also like to see microscope user’s skill and knowledge improved. I did a six-month post-grad course on clinical pathologies that vastly elevated my skill set in regard to the microscope. GrayMed carries a range of microscopes.